It’s the age old question I grapple with : What will I take to work for lunch this week? I stand sulking at the fridge, peering at the jumbled contents. I try to make sense out of the possible ingredient combinations and come up with…zip. Nada. Breakfast I’ve got covered. On work days I am able to endure sameness and routine and on days off I gladly indulge in something made with pastured eggs, like breakfast tostadas. Dinners are usually bits and pieces of meals I have made for clients, or recipe ideas that need a willing tester. There is the occasional nice meal out, or perhaps friends with a culinary bent take pity and feed me lavishly. But, lunch? That’s another story. Not much of a sandwich person. Bready things are easy to pick up, but occasionally leave me drowsy when I most need mental acuity. I adore spicy foods, but my taste buds hit overdrive, impairing my ability to regulate subtle seasoning in my client’s meals. In my never-ending quest for the perfect lunch, I usually arrive at a bean or lentil salad. One or two make appearances each month on The Good Eats Company personal chef menus. This month it’s spicy chickpea and fennel salad, and cannellini bean salad with green beans and black olives. Our recipe today is a variation on the latter, taking advantage of in-season asparagus. Like my very first post on field pea salad with spicy mustard vinaigrette, dishes like this with beans or lentils as the main source of protein are brain foods for optimal alertness and steady blood sugar at a time of day when energy can easily flag after ingesting something doughy, fried or heavy. 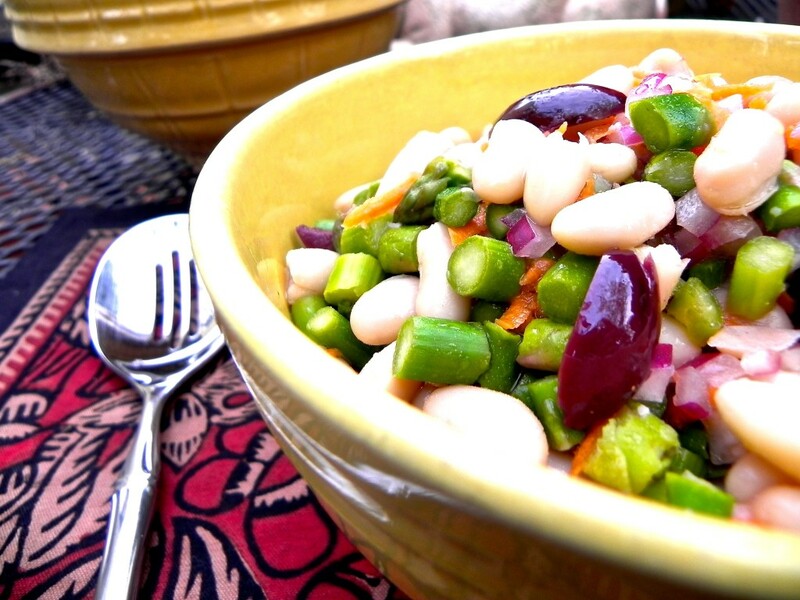 What I love about bean salads are the interplay between creamy, crunchy and chewy. Beans are a blank canvas for bold flavors like assertive vinegars and spices. Their neutral color scheme begs company from colorful veggies and crisp bits. Tinkering with flavor and texture combinations has inspired me to peer into the refrigerated abyss and find new friends for beans and lentils. The pantry is my playground as well. All manner of grains like quinoa, millet and barley pair well with beans. Almost any nut, toasted or raw, will enhance a bean salad. If you have extra time, cook your own beans after presoaking, but don’t fret about using convenient canned beans; you will give a good rinse to remove excess sodium. Lentils and field peas cook in a flash. There is no need to use canned lentils, ever, in my opinion, but frozen field peas are handy and dandy. Most bean and lentil salads will keep in the fridge 2-3 weeks. Colors may fade (the acid in vinegar leaches out color in green vegetables), but flavor is not lost, and you can make your tasty lunch way ahead of time and feel great about eating something homemade and delicious. There. Question answered, problem solved. In small saucepan, bring a couple cups water to boil with pinch of kosher salt; add asparagus and cook for about 2 minutes until crisp-tender; drain and allow to cool to room temperature. In mixing bowl (glass, ceramic or metal -not plastic), combine asparagus with rest of ingredients, stirring gently with clean hands or with spatula, taking care not to mash beans. Allow salad to chill at least one hour before serving; flavor will be great the next day, but asparagus will appear drained of color due to vinegar. Salad lasts in fridge up to 3 weeks if clean spoon used for portion removal. This entry was posted in gluten free, salads, side dishes, vegan, vegetarian and tagged asparagus recipes, bean salad recipes, cannellini bean salad recipes on April 26, 2013 by Michele Humlan.